There is nothing like fresh homemade bread. The smell and the taste will leave you wanting more. Today’s recipe is learning to make pita bread from scratch! It might seem daunting, but pita bread is very easy to make. You will never go back to the store for it when you can make it easily at home. You can prep the dough in a stand mixer or knead it by hand. You can cook the pita on the stovetop or bake them in the oven. Both ways deliver a nice soft pita, with the perfect air pocket inside. You can substitute the all-purpose flour for whole wheat if you prefer a more wholesome pita. You can fill the pita with any of your favorite fillings, like falafel. I will be posting a falafel recipe with tahini sauce soon so watch out for that recipe. Like bread recipes? Check out my paratha recipe that is awesome for a weekend breakfast! Prepping the dough: In a large bowl or stand mixer (with a dough hook attached), add the yeast, warm water, and the flour (for the wet batter). Then mix them well until incorporated. Let the mixture stand for 15-20 minutes so that the yeast activates and it forms into a foamy bubbly batter. After 20 minutes, add the 1 1/2 tablespoons of olive oil, salt, and 2 cups of flour to the wet batter. Start mixing on low speed (if using a stand mixer) or start kneading by hand until a soft dough forms. TIP: The dough should only be slightly sticky. If it’s sticky enough to stick to the sides of the bowl, add a bit more flour. Only a tablespoon at a time. Turn the speed of the stand mixer to low-medium and continue to knead the dough for another 6 minutes until it forms into a tight dough. Take the dough out of the bowl and on to a floured surface and roll it into a ball. Add 1 teaspoon of olive oil into a large bowl and spread it around. Then place the ball of dough into the bowl, turning it around to cover it in a layer of oil. TIP: This is to prevent the dough from forming a crust. Cover the bowl with plastic wrap and set it aside in a warm place for about 2 hours to rise. You can do this inside a microwave or oven. After 2 hours, take the risen dough out onto a floured surface and divide it into 8 pieces. TIP: You can easily get 2 even portions by rolling the dough into a log shape and then cutting it in half first. Then cut each half into halves to get four equal pieces. Then further cutting those into halves to get 8 even portions. Take each piece and roll it into a smooth ball. Then place the balls on a tray and cover again with plastic wrap to rise for another 30 minutes. After 30 minutes, take each ball and place it onto a floured surface. Then, using your fingers or a floured rolling pin, press the dough ball flat and either shape it or roll it gently into a circle. The circle of dough should be about 1/4 inch thick and about 8-9 inches wide. Continue with the remaining balls of dough. TIP: Make sure that you flour your work surface well to prevent the dough from sticking. If a part of the dough sticks to the work surface, lift it and add flour to that area. Baking the Pitas (Oven Method): Preheat your oven to 450° F and place a large baking sheet in the oven to heat up. Place a couple of pitas on the sheet and bake for about 3 minutes. The pitas will begin to puff up and fill with air. Remove the baked pitas from the oven and cover them with a lint-free towel. TIP: A baking stone can be used as well. Cooking the Pitas (Stove-top Method): Heat a cast-iron or heavy-bottomed skillet over medium-high heat and add the remaining 1 teaspoon of olive oil to it. Rub the oil around the skillet and then take one pita and place it on the skillet. 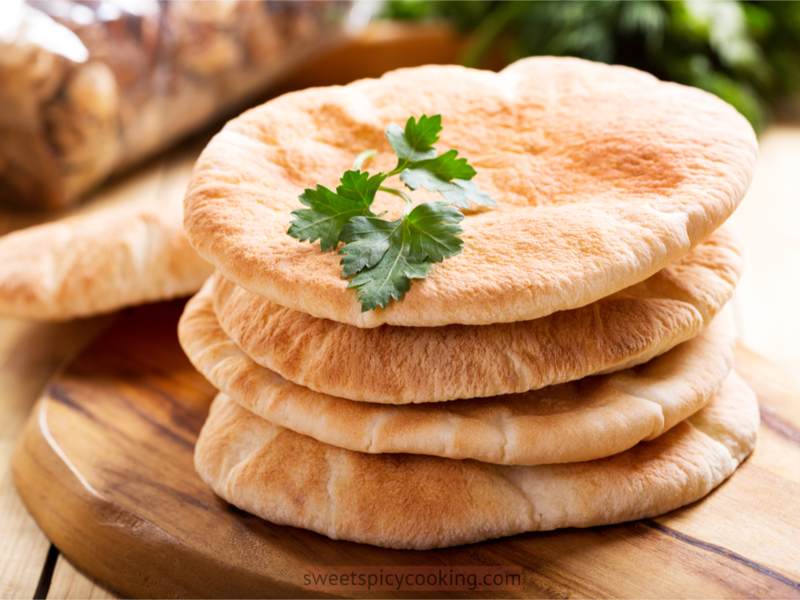 Let the pita cook for about 3 minutes or until the bottom side has a few light brown spots. Flip the pita to the other side and cook for another 2-3 minutes. The pita will also get puffy and fill with air. Remove the cooked pitas and place them under a lint-free towel. Enjoy the cooked pitas filled with your favorite fillings. Storage: You can store the pitas at room temperature for up to 2 days in a tightly closed bag or airtight container. You can freeze them up to a month in freezer bags. Refrigeration is not recommended.